Justen Barstad, Department fisheries technician, holds a trophy pike he caught while ice fishing March 1, 2018 on Lake Oahe. The fish is one that Barstad tagged during spawning work on April 8, 2017. With such a delayed ice-out on Oahe and other waters around the state, the only certainty regarding the spawning of North Dakota’s state fish were the uncertainties. Fisheries biologists set nets on April 23, the latest in the last 30 years. The first pike eggs and milt were stripped into a stainless steel bowl and gently stirred with a goose feather three days later, also the latest since 1997. While photoperiod, or day length, and water temperatures are the combined ingredients pike need to spur reproduction, there was some question when Oahe’s shallower back bays would warm enough to initiate reproduction. “It’s definitely going to be a very short, intense spawning period this year,” Bailey said. “Usually, things are spread out over a several week period where we have lots of opportunities to collect eggs. To be prepared for the inevitable – be it the first or second week in April or much later – the trap nets used during the spawning operation were repaired in winter. Turns out, when the pike decided they were ready, there was hardly a surplus of time. Game and Fish Department fisheries personnel went into spring with a goal of 150 quarts of pike eggs. Between spawning efforts on Oahe and Lake Sakakawea, more than 220 quarts were collected in just two days. Even though the pike spawn was weeks later this spring than typical, it likely won’t influence operations at the federal fish hatchery where room will soon be needed for walleye eggs. Jerry Tishmack, fisheries biologist with Garrison Dam National Fish Hatchery, said the plan was to gradually increase the water temperature in which the pike eggs will incubate to make up for the late spawning date. After hatching, the pike are raised in hatchery ponds until they are about 1.5 inches long. From there, Game and Fish Department personnel transport the pike to lakes around the state. Taking the eggs from mature pike, and walleye after that, is simply the first step in nourishing the many lakes across North Dakota’s landscape that are enjoyed by thousands of anglers. 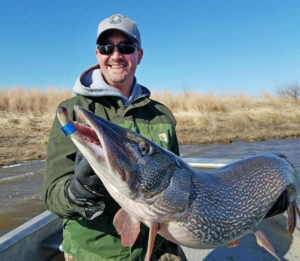 North Dakota Game and Fish Department fisheries biologists tagged dozens of big northern pike in 2017 as part of an ongoing study to determine how anglers utilize trophy fish. While some of those jaw-tagged pike were caught by anglers in winter and the tag numbers reported to Game and Fish, biologists understand that the findings so far are preliminary, considering the small sample size. Scott Gangl, Department fisheries management section leader, holds a trophy northern pike. 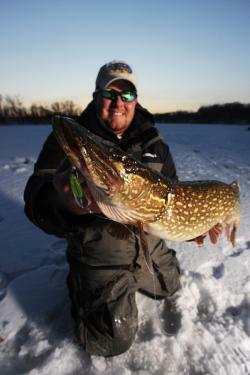 The fish was fitted with a jaw tag as part of study of Lake Oahe’s trophy pike fishery. Yet, understanding the interest by anglers today in trophy management of big northern pike, the small sample size signals a start. The Missouri River System study was initiated last spring during Department pike and walleye spawning efforts on lakes Oahe and Sakakawea. Tags were secured to pike measuring 39.4 inches (1 meter) or longer. In total, 75 qualifying pike from Lake Oahe and 62 from Lake Sakakawea received tags in spring 2017. Paul Bailey, south central district fisheries supervisor in Bismarck, said biologists hope to tag more fish this spring during spawning to increase the sample size of a study that could run the following three to five years. 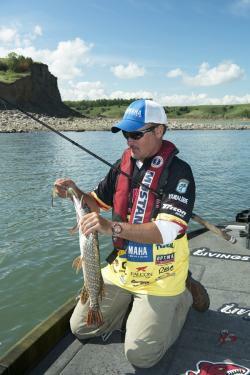 Of the 75 trophy pike tagged in Oahe, Bailey said 19 were caught by anglers. Fifteen were released and four were harvested. And they harvested just 5 percent, Bailey said. Of the 62 tagged pike on Sakakawea, anglers caught and released four and harvested four, according to Dave Fryda, Missouri River System fisheries supervisor in Riverdale. Fryda said one jaw-tagged pike was also taken by someone darkhouse spearfishing. Bailey said it takes a pike in Oahe about a decade to reach trophy size, or the 39.4-inch bar set by Game and Fish for the study. The biggest pike fisheries biologists tagged from Oahe in 2017 was 47.6 inches. It weighed 29 pounds, 7 ounces. 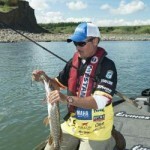 “Oahe is definitely a world class trophy pike fishery now and, at least preliminarily, it looks like our current regulations and angler harvest rates will continue to allow Oahe to produce a trophy pike fishery into the future,” Bailey said. The 42.1-inch pike was about 1 pound lighter from when it was tagged to when it was pulled through the ice. “This fish should put on a bit more weight prior to spawning, but it does confirm how variable weights of these large pike can be over time,” Bailey said. This entry was posted in Muskie and Northern Pike on May 24, 2018 by ronniegarrison. Can Green Bay Produce A Record Musky This Year? Will 2015 Musky Season Produce New Record from Green Bay? GREEN BAY, Wis. — While size and bag limits are the subject of frequent discussion among many anglers, there’s one group of fishing enthusiasts who are relatively unaffected by such matters: musky hunters. A glance at online fishing forums indicates most musky anglers would never keep a musky unless they believed the fish was unlikely to survive or it was a record fish. Steve Hogler, a senior fisheries biologist with the Wisconsin Department of Natural Resources, says his experience with musky anglers on Green Bay and the Menominee River bears this out. Musky anglers heading to northern Wisconsin for the season opener this Memorial Day weekend have good reason for optimism this year – and this 49.3 inch fish from Trout Lake shows why. DNR fisheries biologist Lawrence Eslinger captured the fish, which weighs more than 40 pounds, during a survey of the Vilas County lake about two weeks ago. The fish is now back in the lake. Musky fishing will be the focus of many anglers throughout the northern region of the state this Memorial Day weekend. The northern zone season opens Saturday, May 23 and extends until Nov. 30 on inland waters north of Highway 10 including Green Bay and most of its tributaries. On the Menominee River, the season runs from May 15 to Nov. 30 while on inland waters south of Highway 10, the musky season opened May 2 and runs to Dec 31. While the size limit on most state waters is 40 inches, the 54 inch size limit on Green Bay and the Menominee River distinguish the region as one of a select few in the world capable of producing such large fish. Ample forage in the form of gizzard shad, suckers and alewife help the muskies grow quickly and they typically reach sexual maturity at age 4 or 5 for the males and 7 or 8 for the females. Without a unique partnership involving DNR and half a dozen private sport fishing clubs, however, the trophy musky fishery would not exist. Musky were native to Green Bay but vanished from the region due to overfishing, pollution and habitat loss in the early 1900s. In the mid-1980s, DNR fisheries managers identified the return of a musky population to the region as an important goal, but it wasn’t until private organizations stepped in with funding and volunteer support that the effort could progress. Hogler said Dave’s Musky Club in Kaukauna, Packerland Musky Club in Green Bay, Titletown Muskies Inc., in Green Bay, Muskies Inc. in Sheboygan and the Musky Clubs Alliance of Wisconsin all have made critical contributions to an effort that has resulted in some 155,000 muskies being stocked into Green Bay since 1989. The involvement of the clubs continues, with some providing support for rearing operations after the fish are spawned and the eggs taken to the Wild Rose State Fish Hatchery and the C.D. “Buzz” Besadny Anadromous Fish Facility near Kewaunee. One remaining challenge involves establishing natural reproduction to help sustain the Green Bay musky fishery. Natural reproduction has been occurring on an extremely limited basis in the Menominee River and Little Sturgeon Bay but Hogler said fisheries team members believe greater population density, additional genetic diversity and improved habitat are needed for more successful spawning to occur. Currently, population densities are running below the target range of one fish per 5 acres. Beyond additional stocking efforts now underway to introduce fresh genetics from Great Lakes spotted musky out of Lake St. Clair and the Detroit River, more woody debris along the river shorelines and aquatic vegetation likely is needed to facilitate spawning and provide places for young muskies to hide. In the meantime, however, the waters of Green Bay are supporting a true trophy fishery in which fish larger than 50 inches are commonly caught by anglers. The question, said Randy Schumacher, DNR eastern district fisheries supervisor, is whether the region will yield a record fish anytime soon. These muskies were collected during DNR spring fisheries work on the Fox River. Photo provided by Bill Gerndt, Titletown Chapter of Muskies, Inc.
More world record muskies have been landed in Wisconsin than anywhere else and a 69 pound, 11 ounce fish taken from the Chippewa Flowage claims the current state and world records. While conditions in Green Bay are uniquely suited for producing large fish, the strong catch and release ethic among anglers in the region may prove to be a factor in how long the current record stands. Buying a fishing license is easy and convenient over the Internet through the Online Licensing Center on the DNR website, at all authorized license agents, at DNR Service Centers (Hours for service centers vary; check the DNR website for service center days and hours of operation; DNR Service Centers are not open on Saturdays), or by calling toll-free 1-877-LICENSE (1-877-945-4236). This entry was posted in Muskie and Northern Pike on May 27, 2015 by ronniegarrison. Can I Catch Mid-Winter Pike On Spoons? “Winter walleyes and panfish get high marks from me, but when the action slows down in mid-winter, seems like you can always find willing toothy critters, even on the coldest, nastiest days,” says third-generation Minnesota fishing guide Ty Macheledt. From the large natural lakes of his west central Minnesota stomping grounds to North Dakota’s Lake Sakakawea to prairie potholes, Macheledt’s system for catching pike is a one-two punch of tip-up fishing followed by aggressive rod-in-hand combat with the unfairly maligned northern pike. But he’s not after two- or three-pound “hammer handles, “slough snakes,” or “snot rockets.” The fish that get Macheledt’s blood pumping can peel 40 yards faster than wide receiver Calvin Johnson. But first, Macheledt’s gotta find ’em. To match the perch profile, Macheledt turns to ¼-ounce Custom Jigs & Spins Pro Series Slender Spoons tipped with a soft plastic. Macheledt advises a stout stick, heavy fluoro leader (20 lb. and up), and a spinning reel with powerful, buttery drag that doesn’t freeze up in cold temps, like Frabill’s heavy power 38-inch Gussy Series Ice Hunter Combo. “You’ve gotta have enough backbone to penetrate a pike’s bony mouth. No fairy wands.” The 36-inch medium heavy St. Croix AVID Ice Jigging Rod is another top contender. This entry was posted in Ice Fishing, Muskie and Northern Pike on January 16, 2015 by ronniegarrison. Catching a big muskie will put a smile on your face. Michigan is home to two strains of muskellunge – the Great Lakes muskellunge and the northern muskellunge. Naturally-reproducing populations of northern muskellunge are located primarily in the western Upper Peninsula, but they have been stocked in numerous lakes statewide. Northern strain muskellunge were the primary strain stocked in Michigan until 2011 when the State shifted to raising only Great Lakes strain muskellunge. Still, northern strain fish are occasionally stocked through cooperative arrangements with other states and muskellunge organizations. Photo of boy holding muskie Naturally-reproducing populations of Great Lakes muskellunge exist in the Great Lakes and various connected waters, and they are also stocked into inland lakes and rivers where they do not naturally reproduce Tiger muskellunge, a hybrid between northern pike and muskellunge, were once stocked in Michigan, but no longer are raised in state fish hatcheries. Naturally-produced tiger muskellunge are rarely caught, though they are more prevalent in lakes with high abundance of northern pike. Michigan’s Great Lakes muskellunge are most common in Lake St. Clair and the Detroit River, which feature world-class fisheries for the large, toothy predators. Lake St. Clair has a fairly large fleet of charter boats that target muskellunge by trolling, and a growing contingent of small boat anglers that cast or jig for them as well. Because the St. Clair system is fed by cold, Great Lakes water, the muskellunge season does not open until the first Saturday of June and runs through Dec. 15. Photo of muskie lures This season is being considered in other locations where muskellunge spawning occurs in May and June. Elsewhere, the fishing seasons mimic walleye seasons. Often called “the fish of a thousand casts,” muskellunges are hard to come by; they are slow to mature and take many years to reach the minimum legal size of 42 inches. Legal-sized muskellunge are rarely caught by anglers who are not fishing specifically for them; Man with muskybecause of their large size and sharp teeth, they often break lines. Usually found with shallow weedy lakes and rivers with log jams and fallen timber, muskellunge retreat into deeper water during the heat of the summer. They can be caught by casting or trolling with very large plugs, spoons and spinners — usually behind a wire leader — that are retrieved or trolled at a fast rate or by bait anglers using large suckers. Though primarily fish eaters, muskellunge will take waterfowl or rodents when available. 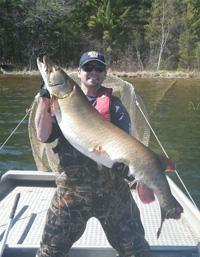 While muskellunge can be taken by hook and line or spearing, there are special regulations on a number of inland lakes. Lake Hudson in Lenawee County, Thornapple Lake in Barry County, and Big Bear Lake in Otsego County are the state’s brood stock lakes and are closed to spearing. For details on Michigan muskellunge, visit http://www.michigan.gov/documents/dnr/Muskellunge_-_A_Michigan_Resource_-_May_2012_386501_7.pdf. This entry was posted in How To Fish, Muskie and Northern Pike on October 14, 2014 by ronniegarrison. Can I Catch Muskie In Kentucky In the Fall? This is the first installment of a series of articles titled “Fall Fishing Festival” profiling the productive fishing on Kentucky’s lakes, rivers and streams in fall. FRANKFORT, Ky. – The angler’s whoop traveled fast and loud over the water from the back of Buck Creek on Cave Run Lake. Bringing a trophy muskellunge to the boat after a spirited fight uncorks raw emotions and provides a unique sense of satisfaction. In this instance, the 45-inch torpedo of a fish was a new personal best and the fourth muskellunge the angler had caught on this cool, calm, overcast Friday in mid-September. The fall muskellunge bite was turning on, and word traveled quickly. A parking lot that held only a handful of boat trailers on Friday was full Saturday. The shorter days, brisk nights and cooler water temperatures of early fall trigger the start of some of the finest muskellunge fishing of the year. Cave Run, Green River and Buckhorn lakes are the state’s top destinations as they have been proven to produce trophy fish. Sarah Terry’s state record came from Cave Run Lake in November 2008 and was caught on a silver Double Cowgirl in-line spinner. It measured 54 inches and 47 pounds. In recent weeks, muskellunge at Cave Run Lake have been caught in the backs of creeks – many of them loaded with weed beds and standing timber – in 8 feet of water or less. Weed beds near submerged channels and across the main lake flats aren’t to be overlooked either. Smaller lures such as a 4-inch balsa wood crankbait in silver and black, a ½-ounce dressed in-line spinner or a ¼-ounce skirted buzz bait can be effective in early fall. As the water cools, consider upsizing to rubber and hard-bodied jerkbaits, and single and double-bladed in-line spinners and spinnerbaits. Buckhorn Lake in Leslie and Perry counties is rated good for muskellunge and holds ample numbers of fish in the 36 to 40-inch range. In early fall, target the back of creeks and shallower areas that have weed beds. The best fishing once the lake level has reached winter pool is on the lower end of the lake by the dam, said Kevin Frey, eastern fisheries district program coordinator with Kentucky Fish and Wildlife. Crank baits, jerk baits and bucktail spinners are proven producers. Generally, orange and sucker-imitating colors work well in the creeks while silver, purple or chartreuse are go-to colors for the main lake. Leatherwood Creek, Otter Creek and Meetinghouse Branch are a few of the best spots for fall muskie on Buckhorn Lake. The tailwaters can be excellent for muskellunge as well. Fisheries biologists routinely see muskellunge exceeding 45 inches on Green River Lake, which is rated excellent for the species. “It certainly still has big fish potential,” said Eric Cummins, southwestern fisheries district program coordinator with Kentucky Fish and Wildlife. While a lot of the standing timber is gone, Russell Branch is one notable exception. Try the slides on main lake bluffs and the edges of flats. Robinson Creek features expansive flats with some isolated brush piles and flooded timber. The upper reaches of creek arms often will hold muskellunge. Where there are shad, muskellunge probably aren’t far away. Give a shad-imitating crankbait a try. Jerkbaits also produce on Green River Lake. Kentucky Fish and Wildlife maintains these fisheries and others around the state by stocking them with 13-inch long muskellunge reared at Minor E. Clark Fish Hatchery in Morehead. 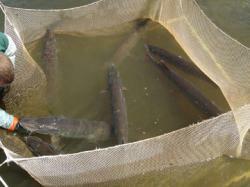 Cave Run, Buckhorn and Green River lakes received stockings of the sub-adult fish this week. On average, it takes five to six years for a muskellunge to reach 36 inches, the minimum size limit in these impoundments. Lake level and outflow information for Cave Run, Buckhorn and Green River lakes can be found online via the Louisville District of the U.S. Army Corps of Engineers’ webpage at www.lrl.usace.army.mil. Kevin Kelly is a staff writer for Kentucky Afield magazine, the official publication of the Kentucky Department of Fish and Wildlife Resources. Get the latest from Kevin and the entire Kentucky Afield staff by following them on Twitter: @kyafield. 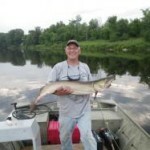 This entry was posted in How To Fish, Muskie and Northern Pike on October 8, 2014 by ronniegarrison. Can I Catch Muskie On A Fly Rod? Dan Small, well-known host of “Outdoors Radio” sent along this tale of his adventures on the way to the recent Outdoor Writers Association of American conference at Lake Placid, N.Y., proving he not only talks a good game, he knows how to play. Dan Small shows the beautiful striped pattern of the 39-inch tiger muskie he landed on a fly rod from New York’s St. Regis River. On my way to Lake Placid for the Outdoor Writers Association of America conference last week, I met my brother Mike and son Jon at Jellybean’s Riverside Campground on the St. Regis River in St. Lawrence County, in northern New York State. Our plan was to spend several days fly fishing for muskies, then head to the conference. Last year on that same river, Mike caught and released a 51-inch muskie (photo attached) that was later certified as a 30-lb. tippet class world record by the Freshwater Fishing HOF in Hayward, WI. He also caught a 49.5-incher on that same river. 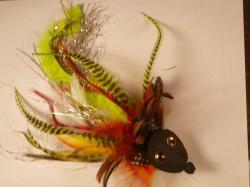 His fly of choice: a Hawg Frawg, which he designed. When I arrived a week ago Wednesday afternoon, Mike and Jon had fished hard with no luck for two hours from a canoe, fighting the gusting winds that preceded a strong cold front on its way across the state. The temperature had been 95 degrees in Syracuse and was still in the mid-80s in St. Lawrence County when I arrived at our campsite. Eager to get in some fishing before the storm, I didn’t bother to suit up, but just grabbed one of Mike’s 10-weight St. Croix rods rigged with a Hawg Frawg in what he calls a “Sting Bee” yellow/black pattern. 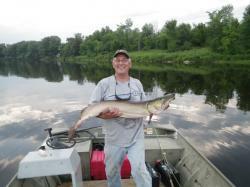 Dan’s brother, Mike, caught this monster 51 inch pure muskie a year earlier from the same location, also on a fly rod. It’s been designated the 30-pound tippet record for the species by the Freshwater Fishing Hall of Fame. Wearing shorts and Crocs, I walked the shoreline of the campground where they had been fishing and made a few casts in a big backwater. Mike had tied a two-foot section of sink-tip line into the leader to make the floating fly dive a foot or so. I was casting, then stripping the fly back toward me. I had only been fishing about 10 minutes when a fish hit my fly. The fight lasted just a few minutes, but the fish that had taken hold turned out to be huge. Mike netted the fish, then ran to get his measuring stick. When we had unhooked and measured it, we realized it was a hybrid or “tiger” muskie, a cross between a northern pike and a muskellunge. It measured 39 inches nose to tail. I did not get a circumference or weight estimate. After photos, we released the fish and it swam off strongly. Later at the OWAA conference, I asked NY Department of Environmental Conservation fisheries biologists Doug Stang and Ed Woltmann what they knew about tigers in the St. Regis. They told me the DEC does not stock tigers or any muskies in the St. Regis, as that river is in the St. Lawrence River watershed. All muskies there are naturally spawned. 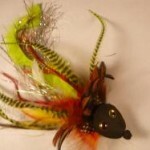 Here’s the hand-tied jumbo fly, the Hawg Frog, that Mike Small designed to fool the giant predators. They said my fish was most likely a natural hybrid produced when a male northern and female muskie happened to spawn in the same area. Woltmann also told me that the St. Lawrence was losing some shallow pike spawning habitat, which was causing some northerns to spawn later in spring and in deeper water, which may have facilitated some natural hybridization. Wednesday night, heavy rains caused the river to rise about two feet. We fished from shore on Thursday with no luck. Jon had one strike but missed the fish. Early Friday morning, Mike had two fish boil on flies before I hooked about a 40-incher on a big streamer pattern. I captured the strike, fight and landing of that fish on a GoPro mounted on my head, but we never got to measure it because it spit the barbless hook, bit right through the brand-new (brand name withheld to protect the manufacturer) landing net and swam off. Mike’s X-rated reaction (also captured on the GoPro) was hilarious. That was the end of our muskie fishing, but I had had enough action to keep me fired up for the entire conference. 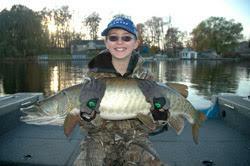 This entry was posted in Muskie and Northern Pike on October 2, 2013 by ronniegarrison. Can I Catch Northern Pike In Smallmouth Lakes? Pro angler Jeff Kriet earns his living catching largemouths and smallmouths, but can’t resist playing with northern pike when he’s on their turf up north. When veteran bass angler Jeff Kriet has a tournament on lakes where smallmouth bass dominate, the Yamaha Pro always gears up for another species, as well. That fish is the northern pike, and Kriet looks forward to catching them, even though he can’t take them to the weigh-in scales. Found primarily across much of the northern United States and Canada, northern pike are one of the most popular sportfish in freshwater because of their aggressive nature. Although fish in the five to 10 pound range are the most common, fish topping 20 pounds certainly are not uncommon. Interestingly, many anglers consider the fish’s length more important than its weight, with 40 inches or longer being the trophy standard. Though pike of 5 to 10 pounds are most common, much larger fish are caught each year, with some topping 20 pounds. Northern pike are probably even more popular in European waters where they tend to grow larger; the present world record, just over 55 pounds, was caught in Germany in 1986, but heavier fish have been reported. Outside of North America, their range includes not only Europe but also Russia and even North Africa, and historically, pike have been popular as far back as Roman times. “When I’m looking for smallmouth and find weedbeds in fairly shallow water, I know I’m probably going to get hit by a northern,” laughs Kriet, “so I brace myself for the strike. Just running a big spinnerbait, or sometimes a buzz bait, along the edge of a weedbed or over the top of it will get their attention. The Yamaha Pro’s favorite pike lure is a 3/4- or 1-ounce spinnerbait, usually with a chartreuse/white skirt and matched with 20-pound fluorocarbon line, a stout baitcasting rod, and a high-speed reel. This combination lets him cast further and then burn the spinnerbait back just under the surface as fast as he can reel it. 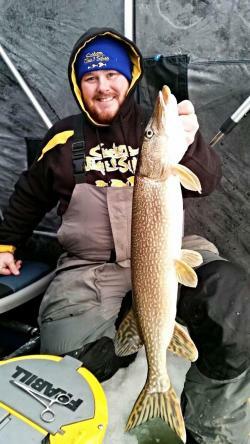 He’s also caught pike on a variety of other lures, including spoons, crankbaits, and even topwater plugs, and frequently, he sees the pike following the lure and actually striking. Kriet says a jumbo spinnerbait “burned” fast is one of the best offerings to attract a toothy pike, but they hit an assortment of lures. “The strike is certainly one of the most exciting parts of northern pike fishing,” Kriet continues, “because it’s really hard and usually close to the surface. Sometimes when I see them following, I’ll stop reeling for a second, or just twitch my rod to change the lure’s vibration, but most of the time, I just keep reeling and the fish smash it. For me, one of the keys to catching them has always been reeling as fast as I could. I think they’re some of the most aggressive fish I’ve ever caught in freshwater. The only real problem Kriet has with catching northern pike is that their violent strikes frequently destroy his lures, even the heavy wire spinnerbaits. “Actually, that’s not such a bad problem to have,” smiles the Yamaha Pro. “Each year when the different tournament schedules are published, I immediately look to see if any of the premier northern smallmouth lakes are included and if they are, I just start packing extra spinnerbaits for the pike. This entry was posted in Muskie and Northern Pike on September 16, 2013 by ronniegarrison.